California has state highway junctions as roundabouts? That’s really interesting. I was just thinking about this yesterday, and realized that although there are lots of roundabouts in Utah, I can only think of two that carry a state highway: one at SR 224/Deer Valley Drive in Park City, and one on the University of Utah campus at Campus Center/South Campus (SR 282). I treat that as a roundabout and think it's reasonable to do so. The main problem with turning left in front of the little island is that there isn't sufficient space for two-way traffic. 45 actually, though NY 85 east of the bypass and NY 140 south/west of it are both 55. This was actually planned as part of a larger freeway to NY 85A near Voorheesville way back when. The ROW on the eastern end of the bypass and Krumkill Road has space for the other carriageway. I never understand what is so difficult about using them. There are several in Michigan and aren't hard to use at all. It's rather simple btw. The traffic in the circle has the right away, there are yield signs at all entries to the circle. It's much better than having traffic lights. NY 590 also comes close at Titus Avenue, though there's an at-grade RIRO just to the south. NB 8 in Fredericton is probably the true example. Carmel when it's all said and done will have around 127. And a total of around 6 signals in the entire city, only 2 of which will be city signals, the rest will be INDOTs. Interesting is that one of the first signals in the US and in Indiana was in Carmel at main and rangeline, that one will stay a signal. Several in the state? Oh, man.... How about several in your everyday drive, say driving through 3-4-6 within 1-2 miles? That is when you really get the taste. Meh... I wouldn't fault anyone for turning in front of the island there. It's just an all-way stop with a big impediment in the middle. If I were driving, I would turn in front of it if doing so wouldn't impede any other traffic, but I'd probably treat it as a roundabout if any other cars were nearby. Meh... That just sounds like a healthy disregard for authority to me. A true dickhead would be the guy who chases down the speeder or red light runner and tries to run him off the road. I would agree. I would only consider someone to be a dickhead if they were actively bothering me. Somebody who jumps through a light one-second-too-late, parks in an active lane of traffic, or drives well over the limit isn't cool, but both seem like a hallmark of city driving to me. I see all three in Seattle too, yet Seattle never makes the list of aggressive-driving cities. Of course, if those things bother you, I can see why you might not like driving in cities. I, on the other hand, relish city driving, as I can screw up without anyone noticing (well, apart from the occasional horn, but no one's trying to kill me). I really found driving in DC to be worse than Chicago, maybe even NYC (though I rarely drove in Manhattan and it was never during rush hour). The only annoying thing in Chicago is people who assume a two-way stop is a four-way stop and cut in front of me when I'm traveling on the street that doesn't actually have a stop sign. The only annoying thing in Chicago is people who assume a two-way stop is a four-way stop and cut in front of me when I'm traveling on the street that doesn't actually have a stop sign. There's a general driving mentality in Chicago that, if you don't go now, you won't get to go ever. I think it might stem from the dearth of left-turn arrows in the city. If you make a left turn at a signaled intersection without arrows the way you're supposed to, you will get to go, just not right now. My experience is that, in heavy traffic, only one person would get to go, maybe two. Once opposing traffic gets a red light, there's always that one car that will cruise on through after the change to red. By the time the one or two cars out past the stop line get to clear the intersection, cross-traffic already has the green. For this reason, I've seen a lot of drivers either (a) turn left the split-second the light turns green in front of oncoming traffic still coming off the line, or else (b) form a chain of five cars turning left after the light has turned red and making cross-traffic just wait there for four seconds of their green time. My experience is that, in heavy traffic, only one person would get to go, maybe two. Right. So wait you turn. And tell the relevant elected official that there's regular heavy traffic at that intersection and it needs an arrow for left turns. 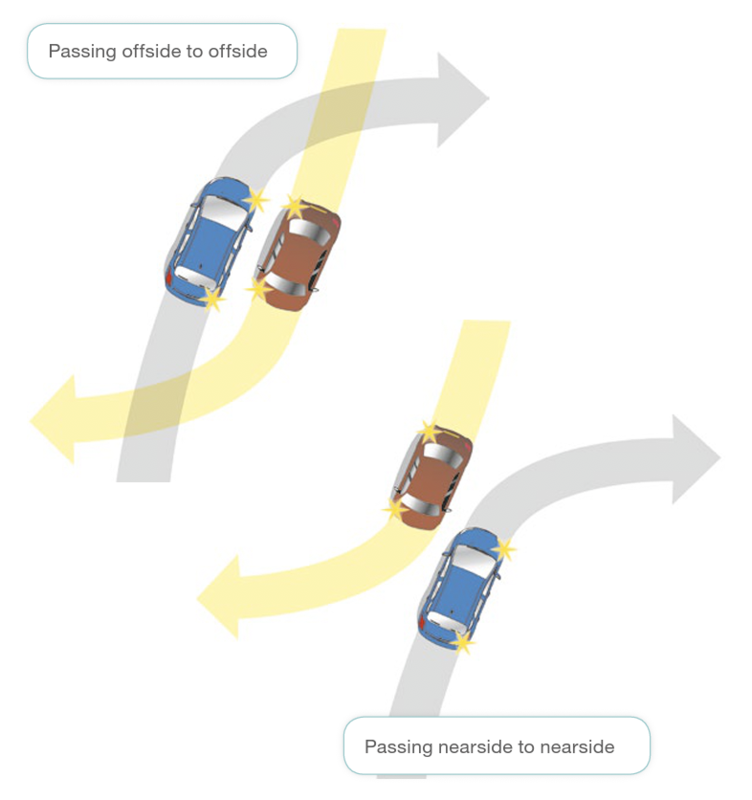 In the UK and some other countries, turning "offside to offside" is allowed by the road rules and is actually encouraged since it gives you a better view of oncoming traffic. If a queue forms behind a vehicle turning offside to offside, it's expected to leave enough of a gap for the oncoming vehicle to turn through. I wish we were allowed to do this in the US too, but I should know better than to trust drivers in the US to use good judgement rather than just force them to use a single method for uniformity. So I would definitely agree with going around the island since it's safer, and even if it's illegal I don't think it would confuse other road users. I've never seen A occur around here before (2-second all-reds make it hard to do), but B is quite common. Though as evidenced in loads of street view images (mostly from Vancouver), two or three cars is the typical 'past the stop line' number of cars (usually only one here in Seattle). Two is most common. Though if it does happen, A is yet another reason not to wait just past the stop line. Pull as far forward as you physically can without getting in the way. After that last car clears, hopefully a good portion of your turn has already occurred, keeping waiting drivers on the side-street from cutting you off. It's particularly important to do so at intersections without left turn lanes, but with wide medians, which are common in Vancouver. I prefer actually getting to where I'm going and, from what I've seen, a lot of other people prefer that too. I'm not sure if you're understanding me correctly or not. 1. You're waiting to turn left. 2. The light turns red, but only the car in front of you has time to turn left. 3. You're now at the front of the line in the left-turn lane (if there is one). 4. Cross-traffic gets the green and does their thing. 5. Cross-traffic gets a red light. 6. A few stragglers finish up their turns during the all-red phase. 7. Your light and that for oncoming traffic gets the green. 8. While oncoming traffic is still getting in gear, you immediately turn left in front of them. The duration of the all-red phase doesn't really have much effect on one's ability to do this sort of thing. Turning left at the green in front of opposing traffic was commonplace in MA when I was a kid, but the practice seems to be lessening. Such is apparently called a Pittsburgh left. In my experience (largely in the West and South) I've seen it done on a few occasions, but almost always it just seems rude. You're right, I misunderstood. My bad. I thought you were referring to traffic from the cross-street setting off the line so quickly as to cut off cars still waiting to turn left. Which seems so odd to me, but knowing Chicago drivers, it seems like a plausible move. I never see the Pittsburgh left around here, except at intersections that meet around the 45-degree mark. The sharper of the left turns can sometimes be made so quickly, you can do it before oncoming cars reach you. I thought you were referring to traffic from the cross-street setting off the line so quickly as to cut off cars still waiting to turn left. Which seems so odd to me, but knowing Chicago drivers, it seems like a plausible move. Oh gosh, no! Not waiting for left-turn stragglers would get you killed in Chicago. That's a T-bone wreck just waiting to happen. This is especially true because those left-turn stragglers are some of the fastest cars through the intersection and there's no turning back once they've committed.